Oxygen (chemical symbol O, atomic number 8) is the second most common element on Earth and the third most common element in the universe. At ordinary temperatures and pressures, free oxygen (unbound to any other element) is a colorless, odorless, tasteless gas that makes up about 21% (by volume) of air. In combination with other elements, oxygen forms a variety of compounds, the most important of which is water. The Earth's oxygen continually cycles through the atmosphere, biosphere, and lithosphere, effected by such processes as photosynthesis and surface weathering. Oxygen is essential for the respiratory function of humans, animals, plants, and some types of bacteria. If the human body is deprived of oxygen for more than a few minutes, the person's brain, heart, and other organs will suffer damage, leading to unconsciousness and death. On the other hand, relatively high concentrations of oxygen, if breathed at relatively high pressures or for prolonged periods, can have toxic effects. Oxygen is the most common component of the Earth's crust (46.6% by mass), the second most common component of the Earth as a whole (28.2% by mass), and the second most common component of the Earth's atmosphere (20.947% by volume). Most of the oxygen is bonded to other elements. Unbound oxygen (called molecular oxygen or molecular dioxygen, O2) is thought to have first appeared in significant quantities on our planet during the Paleoproterozoic era (2500–1600 million years ago), produced by the metabolic action of early single-celled organisms classified as archaea and bacteria. According to expert opinion, this new presence of large amounts of free oxygen drove most of the organisms then living to extinction. The atmospheric abundance of free oxygen in later geological epochs up to the present has been driven largely by photosynthetic organisms—roughly three quarters by phytoplankton and algae in the oceans and one quarter by terrestrial plants. Oxygen was first discovered by Michał Sędziwój, a Polish alchemist and philosopher, in the late sixteenth century. Sędziwój realized that air is a mixture of substances, one of which (later called oxygen) is a life-giving substance. He correctly equated this "elixir of life" with the gas given off by heating niter (or saltpeter, the mineral form of potassium nitrate). Oxygen was rediscovered by the Swedish pharmacist Carl Wilhelm Scheele sometime before 1773, but his finding was not published until after the independent discovery by Joseph Priestley on August 1, 1774. Priestley published his discovery in 1775, and Scheele, in 1777; consequently, Priestley is usually given the credit. Priestley's interpretation of his observations was marred by the then-prevalent "phlogiston theory." According to that theory, a burning material releases an invisible, weightless substance called phlogiston, and the surrounding air (or gas) needs to have the capacity to absorb this phlogiston. Priestley found that the gas he discovered could support combustion for longer than ordinary air. He surmised that this gas contained no phlogiston and could absorb more of it than could ordinary air. He therefore called the gas dephlogisticated air. Antoine Laurent Lavoisier, who helped disprove the phlogiston theory, named the gas "oxygen." He coined the term from two Greek words—οξυς (oxys), meaning acid or sharp, and γεινομαι (geinomai), meaning to engender—based on the belief that all acids contain oxygen and are formed from oxygen. Since then, the definition of an acid has been revised so that oxygen is not necessarily part of the molecular structure of every acid. 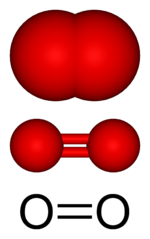 The most common form of oxygen in the air is symbolized as O2, indicating that each molecule consists of two oxygen atoms bound to each other. Oxygen is classified as a nonmetal. In the periodic table, it is located at the top of group 16 (formerly group 6A), which is a family of elements called the chalcogens or the oxygen family. In addition, it lies between nitrogen and fluorine in period 2. At ordinary temperatures and pressures, free oxygen (unbound to any other element) is a colorless, odorless, tasteless gas that makes up about 21% (by volume) of air. Ordinarily, each molecule of oxygen gas consists of two oxygen atoms bound to each other, so the molecular formula is written as O2. This molecular oxygen (O2) is essential for the human body's metabolic processes, which sustain our lives. The human body cannot store oxygen for later use as it does with food. If the body is deprived of oxygen for more than a few minutes, unconsciousness results. The body's tissues and organs (notably the heart and brain) are damaged if deprived of oxygen for much longer than four minutes. Gaseous oxygen becomes a liquid at temperatures below -297°F (-183°C), and it solidifies at about -362°F (-219°C). The liquid and solid forms of O2 are light blue in color and highly paramagnetic (attracted by an external magnetic field). Oxygen can dissolve in water at low concentrations, but even this small amount of oxygen is adequate to support respiration by fish and other aquatic organisms. Readily combining with other elements, oxygen can form a variety of compounds, as noted below. It is classified as a highly electronegative element—in other words, when it is involved in a chemical bond, it strongly attracts bonding electrons to itself. Perhaps the most familiar reaction of oxygen with other materials is combustion. For this reaction to proceed, the relatively strong double bond between each pair of oxygen atoms (in O2) needs to be broken. The combustion of common fuels such as wood, coal, and oil produces carbon dioxide, water vapor, and heat. Ozone, symbolized as O3, is an allotrope of oxygen in which each molecule consists of 3 oxygen atoms. Ozone, a minor constituent of the Earth's atmosphere, is classified as an allotrope of oxygen. Each molecule of ozone is composed of three atoms of oxygen, so its molecular formula is O3. At ordinary temperatures and pressure, ozone is a pale blue gas. In its liquid and solid states, ozone has a deep blue color. Ozone is formed by the effects of an electrostatic discharge on diatomic oxygen. It is also produced when nitrogen oxides (emitted by automotive vehicles) react with volatile organic compounds (such as gasoline vapors and chemical solvents) in the presence of sunlight. If the concentration of ozone near ground level increases, it can be detrimental to health. It can irritate the lungs and cause inflammation, wheezing, coughing, and breathing difficulties, and repeated exposure can permanently damage the lungs. Ozone is a major component of city smog. By contrast, ozone in the stratosphere plays an important role in sustaining life. It forms the "ozone layer," which absorbs ultraviolet (UV) radiation that would otherwise damage living tissue and genetic material. Recently, a different allotrope of oxygen, tetraoxygen (O4), was discovered. It is a deep red solid created by pressurizing O2 to the order of 20 gigapascals (GPa). Its properties are being studied for use in rocket fuels and similar applications, as it is a much more powerful oxidizer than either O2 or O3. Oxygen has 17 known isotopes, with atomic masses ranging from 12.03 u to 28.06 u (where u = unified atomic mass unit). Three of these isotopes—16O, 17O, and 18O—are stable, and 16O is the most abundant (over 99.7%). The remaining isotopes are radioactive, with half-lives shorter than three minutes. 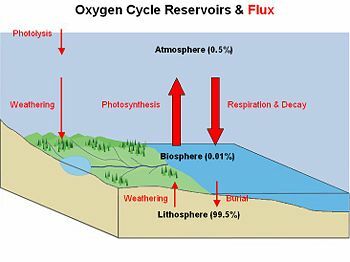 The Earth's oxygen cycles through three major reservoirs: (a) the atmosphere; (b) the biosphere, which is the part of the Earth's shell in which life occurs; and (c) the lithosphere, which is the Earth's crust and uppermost layer of the mantle. This cyclical movement, called the oxygen cycle, is classified as a biogeochemical cycle—that is, it involves biological, geological, and chemical processes. The vast majority (99.5%) of molecular oxygen is contained in rocks and minerals within the Earth. Only small fractions of it occur in the biosphere (0.01%) and atmosphere (0.49%). Free H and N atoms generated by these processes escape into space, leaving O2 in the atmosphere. Oxygen is also cycled between the biosphere and lithosphere. Marine organisms in the biosphere create carbonate shell material (CaCO3) that is rich in molecular oxygen. When the organism dies, its shell is deposited on the shallow seafloor and buried over time to create limestone rock in the lithosphere. Weathering processes initiated by organisms can release oxygen from the lithosphere. Plants and animals extract nutrient minerals from rocks and release oxygen in the process. An oxygen-enriched mixture of gases is useful for several forms of medical treatment. For instance, "hyperbaric oxygen therapy" involves the use of high levels of oxygen for the treatment of specific conditions in which body tissues require an increased supply of oxygen. In addition, a mixture of 30 percent oxygen with 70 percent nitrous oxide is the common basic anesthetic mixture, and a 50 percent mixture of the same gases (Entonox) is often used as an analgesic. Oxygen must be present in every type of "breathing gas," including gas mixtures used in submarines, scuba gear, and space suits. In addition, people who climb mountains or fly in airplanes sometimes have supplemental oxygen supplies. In industry, oxygen-enriched air is used in the manufacture of such products as steel and methanol. In addition, the high-temperature oxyacetylene torch used in welding involves the burning of acetylene in oxygen. Moreover, liquid oxygen is used in rocket propulsion. 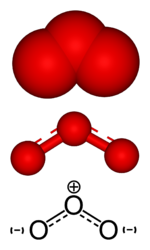 Oxygen forms chemical bonds with almost all other elements. It binds to nonmetals through covalent bonds, and to metals through ionic bonds. For instance, the oxides of carbon, nitrogen, and sulfur involve covalent bonding, while metal oxides involve ionic bonding. The most famous oxide is water (H2O). Another well-known example is carbon dioxide (CO2). Iron forms two types of oxides: iron(II) oxide (FeO), and iron(III) oxide (Fe2O3). Oxygen does not, however, combine with some of the noble gases. Atoms of oxygen form part of the structures of many inorganic acids—such as sulfuric acid, nitric acid, and carbonic acid—and alkaline substances such as sodium hydroxide and potassium hydroxide. In addition, oxygen atoms are contained in the anions of many salts, including carbonates, nitrates, and sulfates. Moreover, oxygen is part of numerous classes of organic compounds, including amino acids (the building blocks of proteins), nucleotides (the building blocks of nucleic acids), carbohydrates, alcohols, aldehydes, ketones, ethers, epoxides, and carboxylic acids. One unexpected oxygen compound is dioxygen hexafluoroplatinate (O2+PtF6−). Neil Bartlett discovered it when studying the properties of platinum hexafluoride (PtF6), which changes color when exposed to air. In the past, chemists used the term "oxidation" to describe the reaction in which oxygen combined with another element. Oxygen was called an "oxidizer," and the other element was said to have been "oxidized." Later, the term "oxidation" was redefined to mean the loss of electrons by an element (in the course of a reaction). Chemists recognized that there was a simultaneous gain of electrons by oxygen or other element, and that gain was called "reduction." More recently, the definition of oxidation was further broadened to refer to an increase in the "oxidation number" of an element, while the term reduction refers to a decrease in the oxidation number of an element. Each element in a molecule may be assigned an oxidation number, which represents the theoretical charge on the element if all the attached atoms and shared electron pairs were (theoretically) removed from it. Highly concentrated sources of oxygen promote rapid combustion and therefore are fire and explosion hazards in the presence of fuels. The fire that killed the Apollo 1 crew on a test launch pad spread extremely rapidly because the capsule was pressurized with pure oxygen at slightly higher than atmospheric pressure, instead of the 1/3 pressure that would be used in flight. Similar hazards also apply to compounds of oxygen with a high "oxidative potential," such as chlorates, perchlorates, and dichromates; they can also cause chemical burns. If a person breathes pure oxygen or an oxygen-rich mixture of gases at higher-than-normal pressures, or at normal atmospheric pressure for a prolonged period of time, the body's tissues become damaged. The person is said to suffer from oxygen toxicity, oxygen toxicity syndrome, or severe hyperoxia. This syndrome may occur, for example, when a diver breathes any breathing gas at a depth that exceeds the maximum operating depth for that gas. Central nervous system (CNS) oxygen toxicity is manifested as dizziness, nausea, and twitching (especially of the face), leading to convulsions. A diver who encounters such problems may drown or suffer lethal pressure damage during a rapid ascent to the surface. Pulmonary oxygen toxicity is caused by exposure to high concentrations of oxygen (at partial pressures of 0.5 bar or more) for more than 16 hours. It may lead to breathing difficulty, pain, and irreversible lung damage. This is a rare complication for divers but may be of concern for patients in intensive care. Retinopathic oxygen toxicity causes damage to the retina. There is an increased risk of CNS oxygen toxicity on deep dives, long dives, or dives where oxygen-rich breathing gases are used. For these types of diving, some diver training courses teach divers to plan and monitor the "oxygen clock" of their dives. Certain derivatives of oxygen—such as ozone, singlet oxygen, hydrogen peroxide, hydroxyl radicals, and superoxide—are also highly toxic. The body, however, has developed mechanisms to protect against these toxic compounds. For instance, glutathione can act as an antioxidant, as can bilirubin, a breakdown product of hemoglobin. To protect against the destructive nature of peroxides, nearly every organism has developed some form of the enzyme catalase, which quickly converts peroxide into water and diatomic oxygen. Oxygen derivatives are prone to form free radicals, especially in metabolic processes. Because they can cause severe damage to cells and their DNA, they form part of theories of carcinogenesis and aging. This page was last modified on 8 January 2019, at 21:20.